Review Trends give you the number of product reviews received over a time frame. Choose products such that at least 50% of the products listed in first five pages have less than 100 reviews with the first three items having less than 400 reviews. This ensures that the product and the niche are easy to penetrate into with little efforts. Reviews influence shopping decisions and most shoppers trust online reviews. A shopper prefers to buy a product with 5000 reviews, even it has a slightly increased price than a lesser priced newly launched product that has less than 10 reviews that is extremely similar. It is better not to try and investing money in products that have more than a thousand reviews. 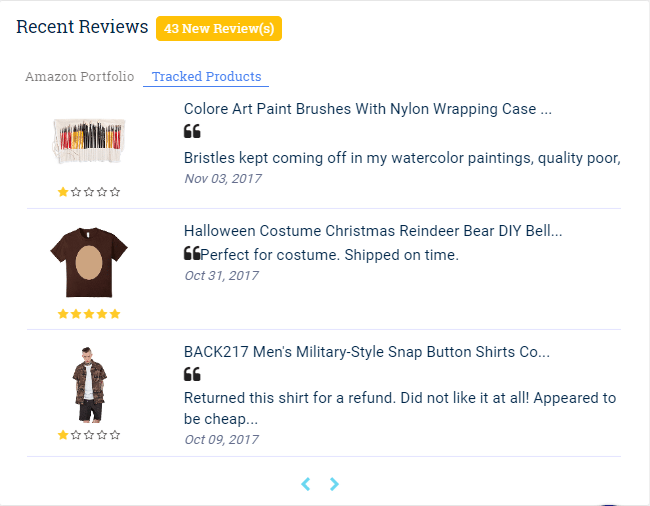 If you are tracking your own Amazon product, with review trends you can analyze how email campaigns, promotional activities requesting reviews worked in your favor. When you employ different strategies to increase reviews, review trends also help you understand which strategy worked better. SellerPrime also gives you an easy access to the newest and the most reviews for a product. If you are in the search for new products to start your Amazon business or to expand your product line, analyzing competitor product reviews give you a good insight into the requirements that shoppers seek. Reviews and ratings go hand in hand. It is quite bad for your Amazon product to have any rating that is 4.3 and below. Set rating alerts to get email notifications of ratings. Get notified instantly when a shopper rates your product below the set range.